Free Program New to Betting? Access all Woodbine sites here. TORONTO, March 22, 2019 – Woodbine Entertainment has released the official logo for this summer’s iconic Queen’s Plate Racing Festival, which runs from June 28-29 at Woodbine Racetrack. For the first time, the logo incorporates the word “festival” recognizing the event’s growth in popularity as a full entertainment experience highlighted by the 160th running of the $1 million Queen’s Plate on Saturday, June 29. This year’s logo is fully engulfed in gold representing the prestige of the race with elegance and fashionable flair. 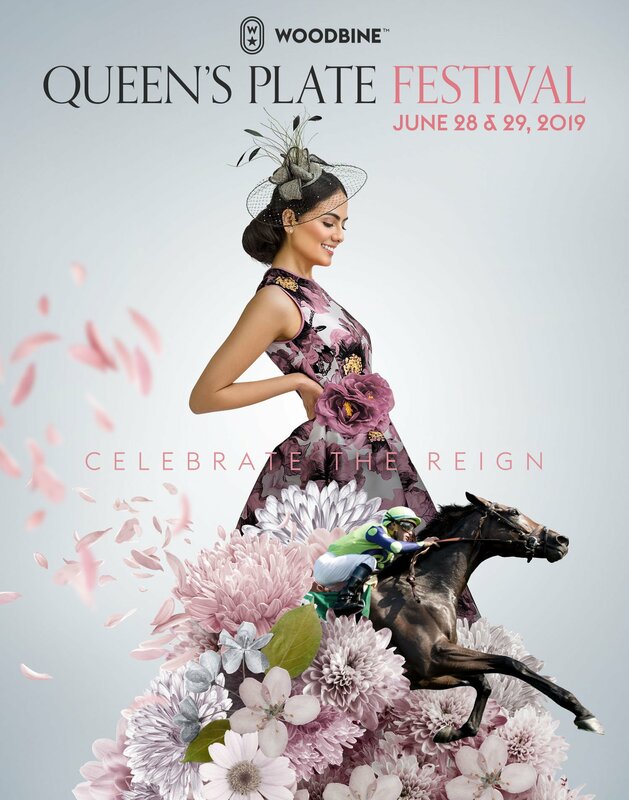 The annual logo refresh commemorates each edition of the Queen’s Plate and is accompanied by a full creative campaign concept that is rolled out across several different media platforms and merchandise promoting the Canada Day long weekend event. Led by Creative Director Ken McConnachie, Woodbine Entertainment’s talented Creative Services Department opted for a more symbolic approach to capture the spirit of the event, with a focus on racing and fashion for this year’s campaign. “We wanted a more simplified approach this year, to tell the event story in a more concise, contemporary way,” said McConnachie, who has directed the artistic vision for the Queen’s Plate campaigns over the past eight years. “After much discussion and visual exploration, we landed on what we think is a very strong visual that symbolizes what the Queen’s Plate is all about. Tickets can be purchased at Ticketmaster.ca for Canada’s premier horse racing festival, featuring the first leg of the Canadian Triple Crown, live music from JUNO Award winner The Washboard Union, delicious dining experiences and renowned attractions including the Hats & Horseshoes Party presented by Stella Artois, Garden Social and exclusive Premium Lexus Lounge. Visit QueensPlate.com or follow @WoodbineTB for the latest updates on all things #QP19. This entry was posted in Woodbine News and tagged 2019 Queen's Plate, 2019 Queen's Plate Logo, Horse Racing, Queen's Plate Festival, The Queen's Plate, Woodbine. Bookmark the permalink.